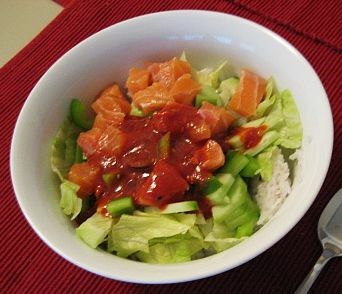 Hoedeopbap is a Korean dish consisting of steamed rice mixed with sliced or cubed saengseon hoe (raw fish), various vegetables such as lettuce, cucumber and sesame leaves, sesame oil, and chogochujang (a sauce made from vinegar, gochujang, and sugar). The fish used for making hoedeopbap is generally either tuna, salmon, or whitefish. The manner of eating hoedeopbap is almost same as that used to eat bibimbap: using a spoon, all the ingredients are mixed together by the diner at the table before eating.